Is there any easy way to download music from SoundCloud to iTunes? 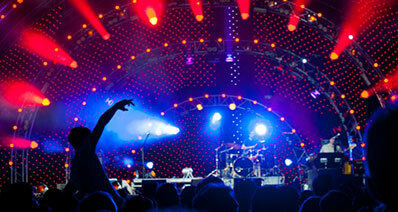 SoundCloud is a huge database with lots of music from different genres and artists. Having such songs in your iTunes library would come with tones of advantages. 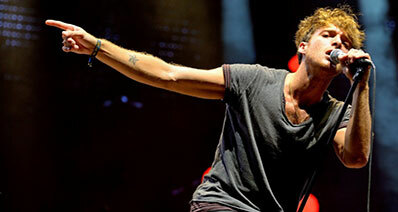 These songs must however be downloaded using an appropriate application. Fortunately, there are a number excellent applications that can help you download music from SoundCloud to iTunes with ease. One of the best software to use is iMusic. If you are an Apple user, you definitely understand how crucial iTunes is in the general organization of your music, videos, and TVs among others in a single place. Fortunately, iMusic music downloader is a great application that can help you solve this problem. This app is no doubt a smashing tinker tool for iPhone, iPod, iPod users when it comes to music download. This tool features amazing capabilities that would virtually entice every user. It can download and record music from more than 3,000 sharing sites which you can later transfer them to your iOS device, Android Device and portable external drive. It supports iOS devices like iPhone, iPad and iPod. This tool is well tested and provides an unmatchable experience. Discover and Download - iMusic downloader features an in-built music library from which you can access and download multiple songs of different genres, artist as well as moods depending on your interest. 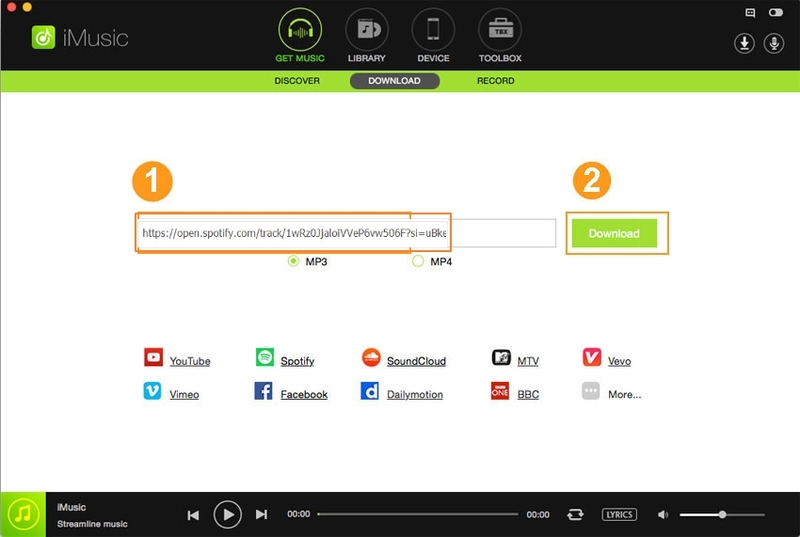 Download music from multiple sites - With this program, you can download music files from nearly all music sharing platforms over the internet which include YouTube, Facebook, Vine, Hulu, Twitter, Vimeo, SoundCloud, and Spotify among others; precisely over 3,000 sites. Online Recorder - This application features a recording feature to enable users to record killer songs on their devices especially when listening to radios and the ID 3tags such as genre and artist name are added to the recordings. Transfer Music - iMusic makes it easy to transfer media files such as music files, playlists, iTunes U as well as podcasts between Apple devices including iPhones, iPod, iPad, and iTunes Library. Robust Toolbox - iMusic Downloader has a powerful toolbox, which is essential in general, management of music related problems in your iTunes Library, iPad, iPod, as well as iPhone devices. Step 1. Click on GET MUSIC and search for music. 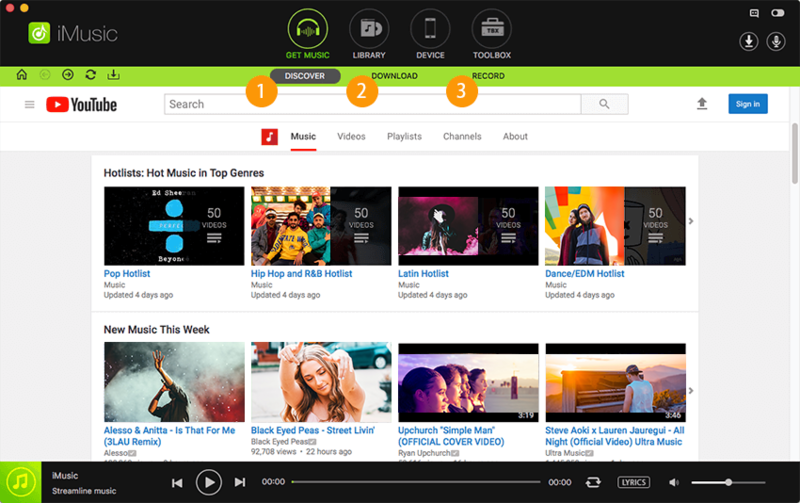 On the main interface, click on “GET MUSIC”. This is where you will access music download options. Here, you are provided with three options, Discover, Download and Record. Step 2. There are basically two ways in which you can download your music. 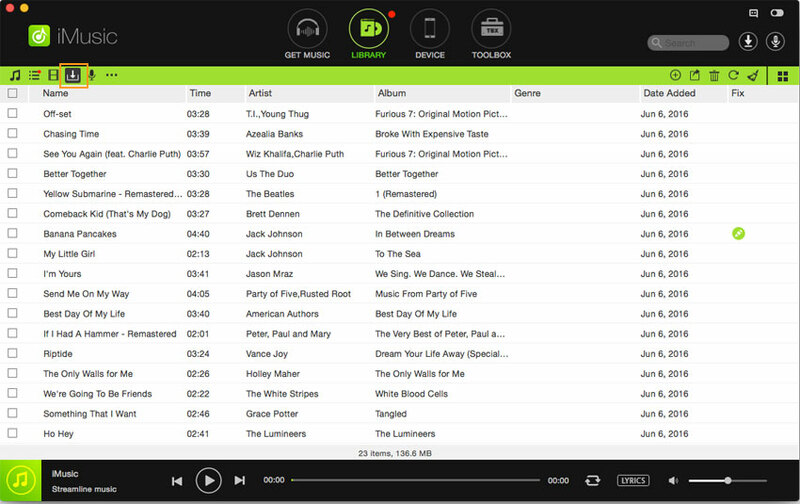 The first case is to click Discover button where you shall be provided with a list of music sources. Click the download icon beside the song of your interest. The other option is to click the Download button from where you will be able to see the Download window. Open your web browser and locate your favorite song in the SoundCloud database. Once you have found the song, copy the webpage address and paste it in the iMusic download box. Here, you can make use of the in-built browser as well. Step 3. Select output format. After pasting the song’s address, choose the appropriate format for the song you wish to download. You can either choose the MP3or MP4 option as the format. Step 4. Download SoundCloud music to iTunes. In case iTunes Library is installed on your device, then the songs would automatically be saved in the iTunes Library. Otherwise, the SoundCloud downloaded songs would be saved to your media library. You can locate these songs by going to LIBRARY then the download icon. SoundCloud Downloader is a webapp to online download SoundCloud tracks, songs, music in MP3 format. On the above, we have recommended the easiest way to download SoundCloud music to itunes by iMusic. Here we collected some tips related to downloading song from SoundCloud to iTunes, hope these could help you a lot. Q1: I want to download a song from Soundcloud to my iPhone, is that available? Solutions: Yes, It is done through the SoundCloud Pro App and you need to pay for it. If you don't want to pay for it , you could try iMusic(win& Mac available) to download soundcloud songs completely free of charge. Q2: Are we able to download the soundcloud songs & playlist from Android mobile? Solutions: Yes, it does. This Soundcloud downloader tool-iMusic is highly optimised for Mobile version . It can let you feel easy to transfer SoundCloud songs from iTunes to Android Phone . Enter the URL of the soundcloud songs or soundcloud playlist and then click Download. Few Seconds later the download process will be initiated. Then Connect your android phone to the pc, choose "Transfer music from iTunes to device". Q3: How much does it cost to use Soundcloud? Solutions: SoundCloud Pro supports SoundCloud Pro and SoundCloud Pro Unlimited. The Pro service costs users $7 per month, while the Pro Unlimited service costs $15 per month. So expensive right? Why not try our iMusic -all-in-one-music management tool to hlep you download, record, transfer and manage music between iTunes and PC/Mac/iPhone/iPad/iPod/ easily and safely. All for free trial. Q4: How do you make an account on Soundcloud? Solutions: First, Go to www.soundcloud.com and click the orange “Sign-up” button on the top right corner of your screen. Second , select your wanted music or mp3, last verify your account. Q5: I want to listen to music offline on Soundcloud, is that available ? 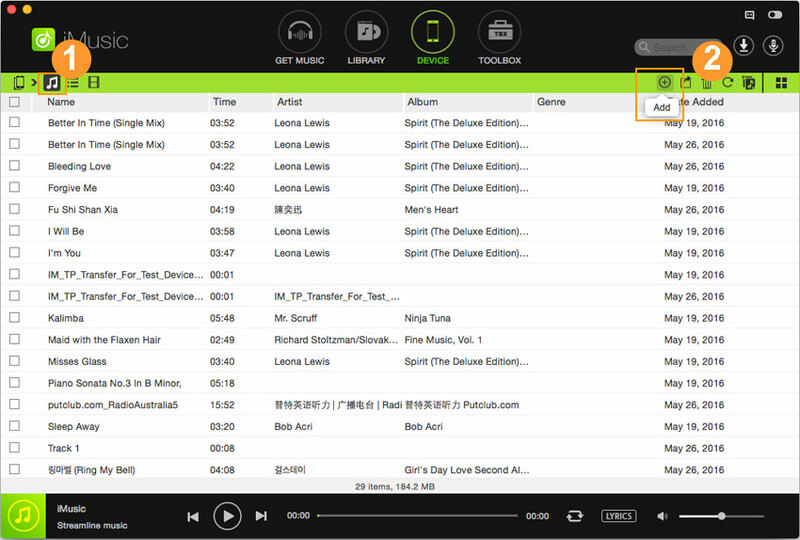 Solutions: To let individual playlists available for offline listening, open the playlist and click "save offline" button . Then you'll see how many tracks are left available for offline listening in the orange progress bar on the bottom of your screen on iOS, or in the pull-down menu on Android. How to Download Music Videos from YouTube?